Chicago, IL (March 13, 2018) — Cobra Electronics, the leading designer and marketer of award-winning automotive, mobile and consumer electronics, today announced the availability of its new HH 50 WX ST and ROAD TRIP HH RT 50 handheld CB radio models. These self-contained, full 40-channel CB radios are ideal for road trips, hiking trails or emergency situations. The HH 50 WX ST features a new rugged, compact design for maximum portability and comfort. This full-featured all-in-one handheld radio accesses all 40 CB channels, as well as all 10 NOAA weather channels with the latest weather and hazardous alert information, 24 hours a day. Cobra’s proprietary SoundTracker® system reduces up to 90% of incoming receiver noise for clear communications on each transmission. The HH RT 50 has the same great features as the HH 50 WX ST, plus it includes a ROAD TRIP kit with an additional magnet mount antenna for greater range during in-vehicle use. Both the HH 50 WX ST and HH RT 50 come with 4 Watts of RF output power, the maximum allowed by law, and can be powered by rechargeable or disposable AA batteries. They also include a 12V DC power cord for in-vehicle use and recharging on the go. 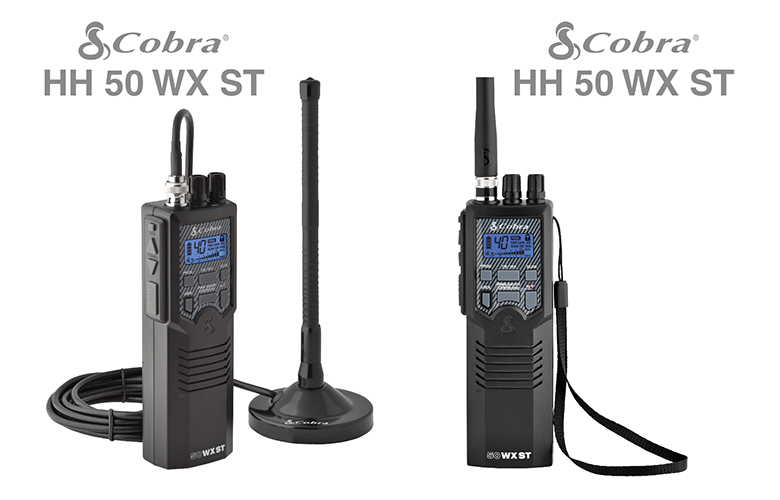 The Cobra HH 50 WX ST and HH RT 50 are available now for retail pricing of $99.95 and $109.95, respectively, at retailers nationwide and through cobra.com.